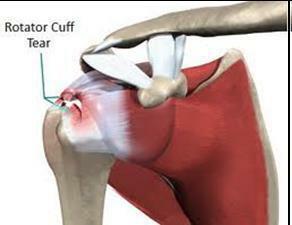 Rotator Cuff Injuries are quite a common occurrence in both the sporting and the older populations. These injuries can range from a minor local inflammatory reaction to a partial to full thickness tear (single rotator cuff tendon/muscle involvement to multiple tendon/muscle involvement). Physiotherapists are able to treat rotator cuff injuries throughout the healing phases. If the rotator cuff tendons are swollen due to impingement, physiotherapy treatment can assist from the acute phase through to end stage rehabilitation or return to sport. Early treatment involves decreasing local inflammation and improving biomechanics to decrease impingement potential. Treatment will include posterior gleno-humeral joint capsular stretching, muscle stretching and strengthening, thoracic and cervical spine mobilisations, and correction of sporting technique if appropriate. Taping and dry needling may also be trialled. If there has been a minor tear of the rotator cuff, conservative management, similar to that for subacromial impingement, will generally lead to excellent results. For larger tears that may require surgical repair, physiotherapy treatment post-surgery is essential to strengthen the weakened tissues and to correct any biomechanical dysfunctions that may have originally contributed to the tear, to not only prevent recurrence of the injury, but also to ensure that the best possible post-surgical outcome is achieved. Returning to full shoulder range and strength following surgery will allow the patient to be fully functional even to the point of return to high level sporting endeavours. Physiotherapy treatment post-surgery can start immediately to decrease the potential loss of the muscle tone of the scapular stabilisers (particularly lower trapezius and serratus anterior) and to prevent cervical/thoracic complications due to wearing the shoulder sling and brace. Most orthopaedic surgeons have their own post-operative treatment protocols, and these treatment protocols are gradually becoming more accelerated.